Ancilla College is committed to providing students with dynamic learning environments, personalized instruction, and small class sizes to promote student success. Ancilla offers more than 25 degree programs from agriculture to criminal justice, business to nursing, and boasts nationally ranked athletic programs. The Autism Program at Ancilla College (APAC) is a newly developed program designed to provide a multi-faceted support system to degree-seeking students on the Autism Spectrum. Founded by the Poor Handmaids of Jesus Christ in 1937, Ancilla remains committed to teaching, learning, service, and faith. We believe in you. Anderson University is a private, liberal arts institution in Anderson, Indiana with a mission to educate students for lives of faith and service in the church and society. Established in 1917 by the Church of God, the university now offers more than 60 undergraduate majors and graduate programs in business, music education, and theology. AU hosts unique student activities every weekend through the Campus Activities Board, and AU’s 20 intercollegiate sports compete in the NCAA Division III, including swimming and lacrosse. Whether through traveling and serving with the Study, Serve, Share program (Tri-S), fellowship with campus ministries, or mentorship with faculty and staff members, this is a place for students to know and to be known. Calling and career connect at Bethel College. A fully accredited Christian college of arts and sciences, Bethel is nationally recognized for academic quality and service. With over 50 areas of study, our career-proven academic approach combines small class sizes with personalized instruction. This has led our students to exceptional success (medical school acceptance twice the national average; 100 percent pass rate on nursing state licensure exam). Bethel’s urban location, with access to more than 16,000 employers, offers great internship and job opportunities. Study abroad programs, clubs, spiritual life, service learning, and intramural and varsity sports are also available. The Bethel Pilots have won more than 36 national championships in 21 sports since 1992. Ranked as one of the most diverse in the Midwest, Calumet College of St. Joseph has historically been a college of opportunity for first-generation and non-traditional students and others for whom the idea of “going away” was impossible. Today, it also counts students from across the country and globe, attracted by high-quality programs in a small-college setting and 18 athletic teams for men and women competing in the Chicagoland Collegiate Athletic Conference. A 30-minute drive from downtown Chicago, the college is committed to a mission of social justice and practices regional stewardship. Blending a career-oriented curriculum with Catholic-education values, CCSJ imbues graduates with academic preparation, ethical standards, and personal responsibility. DePauw intellectually challenges and inspires students to serve and lead. We are known for linking liberal arts education with life’s work, reflected in our graduates’ professional success and global contributions. We are so confident in the outcome of our distinctive liberal arts education, we are the first to guarantee it through our Gold Commitment. With close to 95% of our students employed or in graduate school within six months of graduation each year, students and families have even more assurance that the academic and co-curricular opportunities available will lead to success. At DePauw, faculty, staff and your peers will continuously challenge you to discover your passions and prepare yourself to be a leader the world needs. A global perspective comes naturally at Earlham, with students from nearly 45 states and 65 countries, more than 70 percent of students studying abroad in our nationally-ranked programs and two-thirds of the faculty having led a program in locations spanning Europe, Latin America, Africa and Asia. Earlham offers degrees in 40 fields, as well as self-designed studies, pre-professional programs and a dual-degree engineering program. Through our EPIC Program, all of our students are guaranteed a funded internship or research opportunity. The 800-acre campus includes trails, woods, and ponds for outdoor recreation, with well-equipped facilities for sports. Rooted in Quaker tradition, we expect our students to think rigorously, value directness and genuineness, and seek insights from differing perspectives. The privilege of studying here brings the responsibility to live lives of significance. Many colleges offer a liberal arts education, but at Franklin, we live it. Our students are more than just well-rounded; they’re equipped with unique skill sets and empowered to be tomorrow’s leaders. Rigorous academic programs are designed to expand students’ interests and passions across disciplinary lines while preparing them for impactful careers. At Franklin, faculty-advocates push students to think critically, seek out all perspectives, and examine issues from a multitude of angles. They also help create personalized academic plans ensuring students embark on learning journeys that fit their specific goals. We take pride in our substantial academic offerings, and a commitment to excellence permeates every aspect of campus culture, from community engagement to personal integrity. With over 50 unique campus organizations, students are able to follow their interests and expand their social circle. Goshen College is an affordable, nationally-ranked Christian liberal arts college in Northern Indiana known for leadership in intercultural and international education, sustainability and social justice. The college offers bachelor’s degrees in more than 65 areas of study, as well as select master’s degrees. Goshen enrolls approximately 900 students from more than 30 states and 25 countries and is recognized for its innovative, life-changing study abroad program (Study-Service Term) and exceptional educational value. Rooted in the Mennonite tradition of an historic peace church, the college’s Christ-centered mission produces passionate learners, compassionate peacemakers, global citizens and servant leaders. Grace College is an accredited, Christ-centered institution of higher education. Growth and a culture of innovation define Grace’s reputation for holding fast to its mission while embracing new methods to provide educational excellence. Students at Grace receive hands-on training through applied learning experiences, internships, and cross-cultural trips. Grace College students can opt to save time and money with an accelerated three-year degree in more than 70 majors. Grace offers on-campus and online graduate degrees, associate degrees, and bachelor’s degree completion programs. Grace College is a Christ-centered, connected community of higher education that applies biblical values in strengthening character, sharpening competence, and preparing for service. business students graduate with a paid, project-based internship, and Hanover is the only college in the state to offer undergraduate health and biomedical science students both a cadaver lab and human patient simulators. Hanover’s traditional liberal arts majors prepare students well for the world after college, with 98 percent of graduates employed or in graduate school within seven months of graduation. Holy Cross College is a Catholic, residential, coed, four-year institution of higher learning, offering an applied liberal arts curriculum. Holy Cross College is committed to helping students develop their passions and skills through a practical and personalized education, and students, in turn, use their hearts and minds to make a positive impact on the local and global community. Our unique partnership with the University of Notre Dame and Saint Mary’s College gives our students countless academic and extracurricular opportunities across our tri-campus community. Huntington University is a comprehensive, Christian, liberal arts university with programs in more than 70 academic concentrations, including animation, film production, nursing, exercise science, agribusiness and occupational therapy. Huntington offers undergraduate degrees online, as well as in Huntington and Peoria, Arizona. Students gain hands-on experience through our Enterprise Resource Center, which connects students with businesses, social service agencies, churches, and government offices across the country, and have the opportunity to do research with professors. Committed to providing a quality, Christ-centered education to all its students, Huntington educates men and women to impact the world for Christ through scholarship and service. Established in 1930 in Fort Wayne as an engineering college, today’s Indiana Institute of Tech is a comprehensive university that arms its students with career-focused degrees and skills that employers seek. This private, not-for-profit university specializes in degrees in business, engineering, computer science, criminal justice, health care administration, exercise science, and education. In all, Indiana Institute of Technology offers more than 60 options at the associate, bachelor’s, master’s, and Ph.D. levels. We prepare students for active participation, career advancement, and leadership in the global 21st century society and motivate them toward lives of significance and worth. There’s a unique energy at Indiana Wesleyan University — a combination of innovation, purpose, and faith. Students discover their God-given life calling and develop in character, scholarship, and leadership. IWU offers over 80 undergraduate and 35+ graduate degrees. Committed to growing as a multicultural institution, IWU seeks out and celebrates the uniqueness in all of God’s creation. Living on a beautiful sprawling residential campus, students run the school’s McConn Coffee Co.; conduct, publish, and present research; and travel the globe. IWU Wildcat athletics have won 168 conference championships, 29 NCCAA and 12 NAIA national championships. The university system includes IWU – Marion, the main campus; IWU – National and Global, which includes international adult learners who study online or at 15 education centers; and Wesley Seminary. graduate school or the career of your dreams. With more than 60 areas of study, you can follow your deepest passion — or discover a new one. Your Manchester experience may take you to the jungle of Nicaragua, a café in Paris or a stream in Alaska. You’ll learn, too, as you experience the joy of making a difference in other people’s lives. Tell us where you want to go, and we’ll help you get there. What are you made of? It’s a pivotal question. At Marian University, we’ll challenge you to think about who you want to become. You’ll work hard, but faculty will support you every step of the way. Participate in research projects and field experiences. Choose from undergraduate and graduate programs, including a dozen pre-professional programs focused on health science.Engage in hands-on learning and study-abroad programs. Compete in varsity and intramural athletics. Learn to be a creative problem-solver, critical thinker, and clear communicator. Connect with top employers for internships and jobs. Graduate with the skills to be a leader in your chosen profession—and a passion for making the world a better place. Martin is a liberal arts institution that prides itself on being unique, future-oriented, and student-centered. The university offers theoretical and experiential learning experiences that allow full immersion in the student’s chosen field. Martin’s mission is to provide excellence in educating and developing traditional and non-traditional students in an inclusive, supportive, and healthy collegiate environment. Martin offers 10 bachelor’s degrees in an array of disciplines including addiction counseling, religious studies, and criminal justice. Students enjoy the benefit of the unique service learning and leadership curriculum, individualized degree plans, and the personal attention of faculty mentors. For more than a hundred years, Oakland City University has taken a different approach to higher education—each student is treated as an individual, and bold, imaginative teaching and personal interaction between students and faculty remain fundamental. OCU’s four schools provide a wide array of over 50 degree options, including doctoral and master’s, that are designed to meet the diverse needs of students and their future employers. The university has historically offered traditional liberal arts programs, such as English, math and social sciences, and business degrees are offered in both traditional and accelerated formats. OCU is known throughout the United States for its Secondary and Elementary Education and Christian Studies programs. graduates has been nearly 100 percent, with the average starting salary for 2018 graduates more than $70,000. Approximately 85 percent of students participate in student organizations, performing arts, recreational sports, Greek organizations, student newspaper, and/or NCAA Division III men’s and women’s sports. Saint Mary-of-the-Woods College combines hands-on learning, personal attention, and eye-opening social, spiritual, and leadership experiences to empower women and men to aspire higher. Students find their voice in an environment of life-changing opportunities with top programs in business, education, equine, music therapy, and nursing. Rooted in the Catholic tradition, students grow to think critically, engage in lifelong leadership and effect positive change in a spirit of service and social responsibility. This exceptional liberal arts preparation leads to a 94 percent placement rate, based on a recent survey of responding graduates who reported being employed or seeking to further their education within one year of graduation. Nearly 30 percent of students participate in 13 intercollegiate sports. humanity, or exploring areas of scientific discovery. Don’t leave your faith in the hallway. Taylor University is a Christian liberal arts college dedicated to academic excellence and whole-person discipleship. With state-of-the-art equipment and facilities, award-winning art and science programs, numerous travel opportunities and a vibrant campus community, Taylor challenges students to ask questions, think critically, examine assumptions and interrogate faith and learning. Taylor alumni go on to rewarding careers in every field, from engineering, kinesiology and medicine to teaching,writing, and filmmaking. Taylor is ranked in the top three nationally for short-term study abroad. For over two decades, U.S. News & World Report has ranked Taylor in the region’s top three colleges in the Midwest. Since its founding in 1884, Trine has been known for excellence in everything it does. The fastest-growing private college in Indiana, Trine offers students more than 35 majors in fields like business, criminal justice, education, engineering, health sciences, and more — providing about $31,000 in financial aid on average to each student. Last year, 99 percent of graduates were in graduate school or employed in their field within six months. Trine has invested $155 million in new and renovated facilities since 2000 on its beautiful high-tech campus. Trine’s Thunder Ice Arena, home to five new men’s and women’s hockey and synchronized skating programs, and the new MTI Center, an athletic and event center serving men’s and women’s basketball, bowling, golf, and esports programs, were both opened this last year. Founded in 1854, UE is a comprehensive university, providing career paths through the arts and sciences and pre-professional programs. UE is affiliated with the United Methodist Church and offers more than 80 majors and 100 areas of study. More than half of UE students study abroad, many at Harlaxton College, UE’s living and learning center in Grantham, England. Student-athletes compete in NCAA Division I, and students may join and lead more than 120 student organizations. UE is the first in Indiana to be designated as an Ashoka U Changemaker Campus and its changemaking culture empowers students to improve the world around them. UE’s true value is proven by student successes—94% of the class of 2017 were employed or in graduate school within six months of graduation. 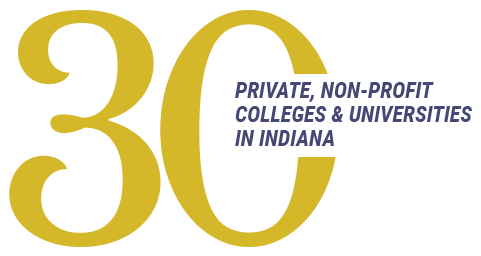 One of the Midwest’s top-ranked private universities by U.S. News and World Report, the University of Indianapolis is recognized for an educational environment that converges real-world experience and personal attention. A liberal arts core emphasizes critical thinking, problem solving, and creativity across 100 undergraduate programs, 40 master’s programs, and five doctoral programs in arts and sciences, business, education, engineering, health sciences and psychology. The University is also home to the UIndy Health Pavilion, which brings together nationally-ranked programs including nursing, physical and occupational therapy, psychology, and related health programs. As an NCAA Division II school, the University offers 23 men’s and women’s sports with teams that routinely excel in both athletic competition and academic performance. The University of Notre Dame, an independent Catholic university founded in 1842 by the Congregation of the Holy Cross, is ranked among the top national institutions of higher learning and offers approximately 75 degree programs within five colleges. Notre Dame’s 98 percent retention rate between freshman and sophomore years is among the highest in the country. Notre Dame’s overall graduation rate is 95 percent. Students take advantage of international study, community-based learning, and undergraduate research opportunities. Although not required, 85 percent of Notre Dame undergraduate students are actively engaged in service work. Notre Dame meets 100% of students’ demonstrated financial need. Rooted in the Catholic and Franciscan traditions, the University of Saint Francis serves dynamic and diverse students who are inspired to “pay it forward.” With 70+ academic programs, students are guided to fulfilling careers by expert faculty every step of the way. USF’s reputation ensures that top companies seek our graduates, with 94 percent working, pursuing additional degrees, or serving in the military or volunteer programs within six months of graduation. Students extend their education through 40 organizations and 17 intercollegiate sports; the Cougars are proud of their six NAIA national championships and 46 championship appearances. The university has added USF Downtown to showcase its business and music technology programs, where students engage in hands-on experiential learning in our renovated historic buildings located in a vibrant and bustling urban setting. Located about an hour southeast of Chicago, Valpo offers more than 70 programs within five undergraduate colleges, including Christ College — The Honors College. Valpo combines a liberal arts background with degrees in STEM fields, health care, business, and engineering — backed by a placement rate above 90 percent for 25 consecutive years. Valpo offers leadership, research, community outreach, study abroad and internship opportunities, and more than 100 extracurricular activities, including NCAA Division I Athletics. State-of-the-art facilities include one of only five solar furnaces in the United States, Doppler radar, and the recently opened Center for the Sciences: Chemistry and Biochemistry. Founded in 1832, Wabash offers 25 liberal arts majors, pre-professional programs in medicine and law, and dual-degree programs in engineering. Liberal Arts Plus Initiatives provide students co-curricular opportunities in Democracy and Public Discourse, Digital Arts and Human Values, Global Health, and the Center for Innovation, Business and Entrepreneurship. Wabash students follow the Gentleman’s Rule, which calls them to conduct themselves as gentlemen and responsible citizens. Athletes compete in 12 sports in NCAA Division III and the North Coast Athletic Conference. Wabash is consistently nationally ranked for its alumni network, career services, internship program, and quality and accessibility of its faculty.